As I’m sketching out some of the sites I would like to see on this adventure I’ve come across some amazing hotels. Some of the locations are seasonal so it might depend on my ability to be in a certain part of the world at a certain time. Like the Ice Hotel in Sweden which is only open from November through April because that is the only time of the year when it is structurally sound. The hotel is made entirely of ice and reconstructed each year out of over 3000 tons of ice and 30000 cubic meters of snow. 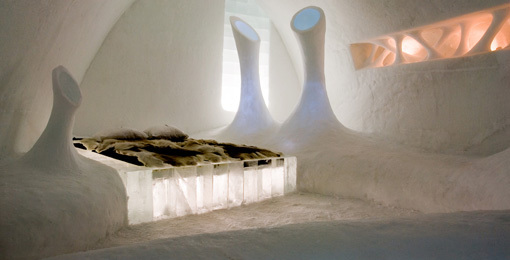 You sleep comfortably on a bed of ice, snow, and reindeer pelts in a brisk -5 degrees Celsius (23 degrees F). Then on the opposite end of the continent there are the Fairy Chimneys of Turkey. A 1500 year old complex of caves that were once used for wine making as part of an early Byzantine monastery. All points in between… Unusual Hotels of the World is a semi-comprehensive collection of the eccentric to the truly bizarre where lodgings are concerned. I’ve found a great many hotels I’d love to stay at here in the United States if I had the time and the money (most are expensive, in the $250-$350 range). Regardless, any of these places will be an experience and a nice change from the multi-person dorms I will likely spend most of my nights in. Ira Glass and the team from This American Life are some of the best storytellers I’ve ever heard. Their weekly radio show tells the stories of everyday people (and some not so everyday people) around a central theme. If you’ve never heard the show you absoluely must take the time to check it out. If you’re interested in storytelling, the process of storytelling, or how to create a quality production, take the 20 minutes and watch the videos below. Scott McNealy, former CEO of Sun Microsystems, is on the road promoting an Open-Source Education site named Curriki (Curriculum + Wiki) where educators, students, parents, and interested people can post and review educational materials. McNealy has been a vocal leader in the charge for Open Education since he stepped down as Sun’s head honcho. From holding summits on open education to the newly launched Curriki; I believe he is someone with the clout, connections, and money to get this movement moving. I have been a proponent of open-source education since seeing the amazing gesture of MIT’s OpenCourseWare (OCW) initiative. I believe it has the power to change the world in an incredibly positive way. I’ve been having arguments with friends and strangers about the topic for the past 3 years or so. There is a lot of heated opinion on the topic and a lot of fear. I’ll put my money on the inevitable change of the system. Wikipedia changed the world of research for many of us. It put an easily accessible, wildly dynamic, sometimes inaccurate (rarely, please, all the media hubbub is about the misuse of the system, critical thinking still has to apply), open platform for information available to EVERYONE. Hopefully this is what Curriki will do for global education. I will hope to find a way to be a part of this revolution. My first effort OpenCourseNetwork.com was to be a collection of all the courses available through the OCW programs coupled with an emphasis on community, which I felt the OCW sites lacked, and using Moodle to enable the community to actually run their own courses. Due to my limited coding ability and lack of time to dedicate to the effort, it stagnated. I still believe in the idea. Education for our children will be radically different that it was for us. Don’t look at the incredibly narrow picture of just the children of the USA. Global Open-Source Education holds the promise of bringing high quality education to the children of all the countries of the world. You can either join in and help to make it the best possible system or be one of those people that sits back and mumbles about “back in my day”. I believe very strongly in dreams. By dreams I mean aspirations, goals, etc… An idea of the life you want or the person you want to be. I believe I’ve always tried to live as close to my dreams as possible, filling in the in-between time with preparation to reach a certain goal. I was single throughout my adolescence, and in that time I tried to understand what kind of a man I wanted to be, so as to be right for the kind of woman I hoped to find. I found in the intervening years most of that preparation wasn’t necessary. That’s what actual life experience teaches you. However, I have found that I very much like the man I’ve become and I couldn’t be happier with the woman it has brought me to. Preparation is important, but knowing what you want is even more so. It provides you with a plan. A picture of the outcome you hope to achieve. Another mistake I made while I was younger was that I thought I had to have the whole picture defined. I’ve since learned that only the outline is necessary, the details will fill-in with the doing. In terms of the trip I have coming up I don’t know exactly what I want out of it. I know I want a story worth telling. I want an experience that I can learn from. I want, as I believe I have always wanted, to be a better man for having done it. This all might seem a little lofty, but if you are to continue reading my writing you might as well get used to it. I sometimes write like I’m authoring a self help book. Know that in the end, the audience is my elder self, and maybe my eventual family. I think I want to become a writer during this journey. Some have told me I already am, but I believe right now I am just someone who writes. I’d like to become a writer. I hope also to become a photographer. Either of these goals will be fulfilled in the doing. I plan to write every day I’m on the road, even if it is just a few lines. I plan to take pictures every day, even if it’s of nothing of consequence. By doing these two things I feel that I’ll be able to learn from my mistakes and by the time I get back I’ll have piles of material I might be able to do something with. What will I do with it? That remains to be seen. Will it be worth anything? If only to me and the people that want to hear the stories, it will be priceless. Grand scheme? Who knows, that is usually realized far after the fact. In closing, find a dream and run after it like death itself is chasing you. Because it is. The van has received its check up and some new tires. All signs point to it being a very reliable cross country vehicle. While I miss the WRX I’ve really started to like the van. I still catch a huge amount of flack about owning a “Van.” Lots of jokes and comments, but then everyone says “I used to own one like this” or “My family had one like this.” Yeah they did, and they dug it. The gas mileage is absolute garbage and I imagine flowers wilting as I cruise by but it is a means to an end. I’m really looking forward to piling six other people in it and heading off to the Redwood National Forest then to Vegas. That will be a hell of a road trip and only the beginning of my cross-country, round-the-world adventure. There is a little concern about heading East alone after 2 full days of Vegas-ing. I’m not sure how far I’ll make it before I decide to pull over and curl up at a rest stop with a large bottle of water and sleep. There is something about driving a vehicle that is meant for long road trips. Every time I get in it I envision the 7000 mile route I plan to take. There is something about a vehicle that large that just feels like freedom. I haven’t even taken the sleeping bag, camping stove, dehydrated camp food, or fishing pole out of it since the time Summer and I took it camping. I guess I still like the feeling that if I wanted to I could take a turn somewhere, head off in a direction, and have everything I need. So I know I’ve been negligent in posting for some time. February and March were incredibly busy and full of significant dates (My 1 year anniversary with Summer, 30th birthday, etc… more on those soon) plus a bunch of travel preparation landmarks (Sold my car :(, Purchased my Eurail pass, more on these too in upcoming posts) but today I’m going to rant about Sony. Sony PS2 – about 6 months after purchase the console stopped reading new games or DVDs. Only after some serious VooDoo (opening and closing the tray repeatedly at different angles) would they occasionally play. Sony PSP – excellent game platform, again, horrible software and support. Sony Minidisc Recorder – This is the industry standard for high quality mobile audio recording. However, due to their misguided interpretation of DRM, you could not move the audio you recorded off the device in a digital format even though it was stored in one. This caused you to run a cable to your audio-in on the laptop and record it in real time. This is an incredibly painful process and can lead to a loss of quality. They have yet to make any changes to their software for this despite the user community’s loud protests. And finally the Sony IC Recorder (ICD-SX46) – I’ve really enjoyed this product as a voice recorder. It records a very high quality signal and lasts a very long time on the two AAA batteries. Today I decided to get my recordings off of it to make some space for an upcoming project and needed to load the software on my current laptop. Off I went to Sony’s support site in search of their proprietary software (which was amazingly poor in earlier versions but allowed transfer of the recordings in digital format) and I couldn’t find it. Just the updates, not the main product. I chatted with support who told me to call the Accessory Sales department. According to her they don’t post original software since it was shipped with the product, just the updates. The Accessory Sales department asked me for a credit card so that I might be billed $28 for a new copy. I asked for the customer service number, same story. I wouldn’t pay $28 for the software in the first place based on it’s limited performance, let alone pay for something every other electronics company provides for free to its registered customers so that they can use the products they’ve purchased. So, Sony, I’m done with you. I’ll recommend to anyone that will listen, not to buy your products. You need to mend your ways, at least in the realm of software and support. Anyway, sorry for the rant, more positive posts to come.